Three dimensional virtual spaces are being used to map information for easy exploration and navigation. 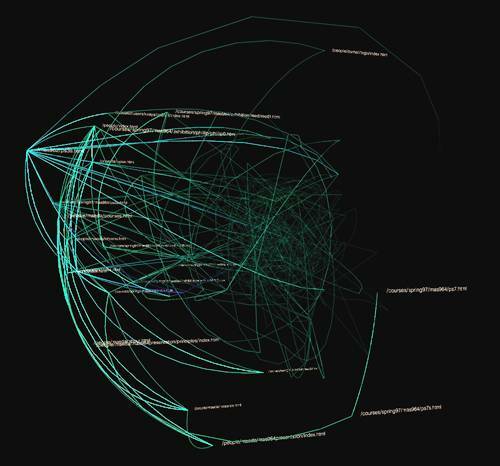 A ghostly information visualisation of traffic through a Web site called Valence. It was created by Ben Fry, as part of his research into organic information design in the Aesthetics and Computation Group at the MIT Media Lab. 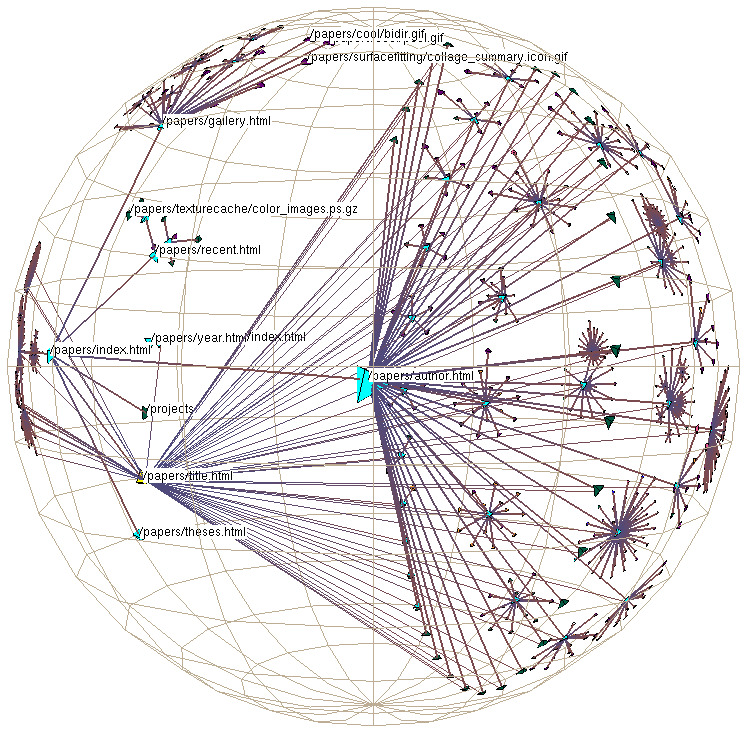 The image above is a VISVIP visualisation of a user path through a Web site. 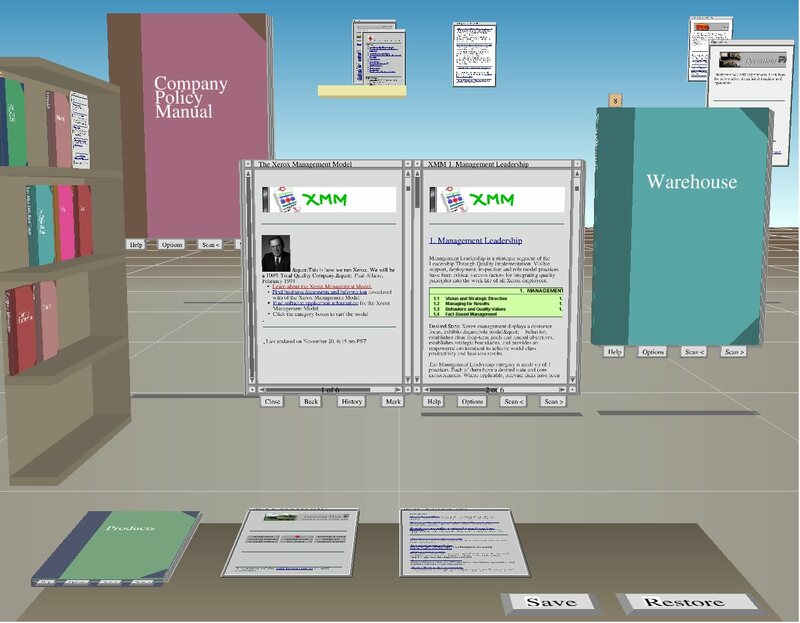 It was developed by John Cugini and colleagues in the Visualization and Virtual Reality Group at the National Institute of Standards and Technology, USA. The user's path through the site is shown by the curving yellow line overlaid on the site structure. The length of time spent at each page is represented by the height of dotted line projecting up from the graph. 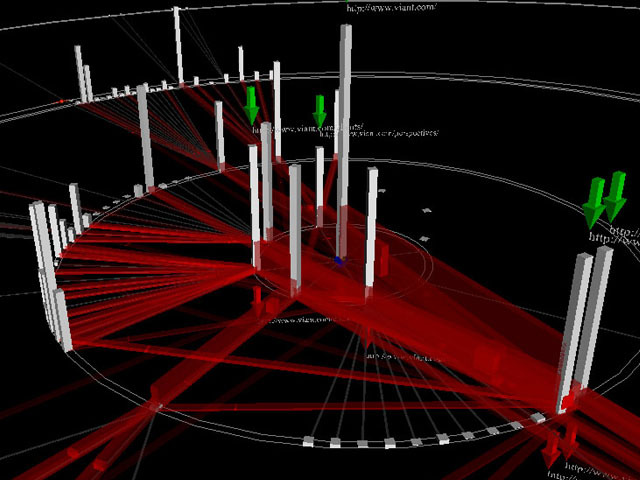 The WebTraffic project is developing prototype 3D visualisations of online behaviour. The project is lead by Antoine Visonneau, with colleagues in the Center for Design Informatics, Harvard Design School. Their current designs use VRML to visualise traffic within a website, with the vertical gray bars being individual pages and the red lines. The work of Tamara Munzner, whilst a grad student at Stanford University, in visualising information, such as the link structures of the WWW, using three-dimensional hyperbolic spaces. For more information see her papers "H3 : Laying Out Large Directed Graphs in 3D Hyperbolic Space" and "Visualizing the Structure of the World Wide Web in 3D Hyperbolic Space". 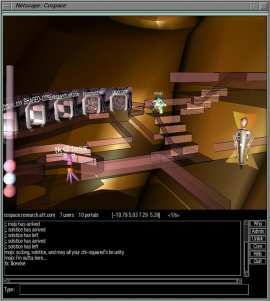 The information visualisation and navigation tool called PerspectaView was developed by Perspecta. Their information space was created using the SmartContent System. Visualising information spaces using Apple's Meta Content Format (MCF). The Hotsauce plug-in allows you to fly thru the information. It was developed by R.V.Guha. 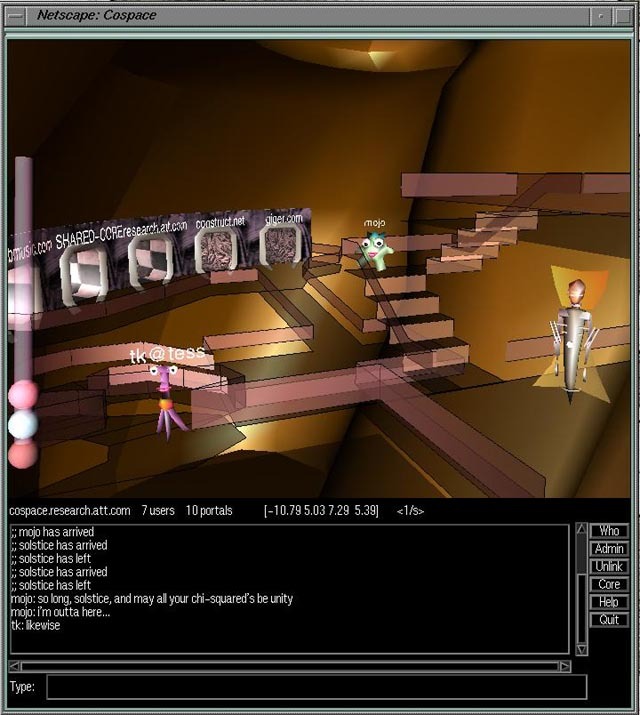 cospace was an experimental 3D shared environment for browsing the Web. 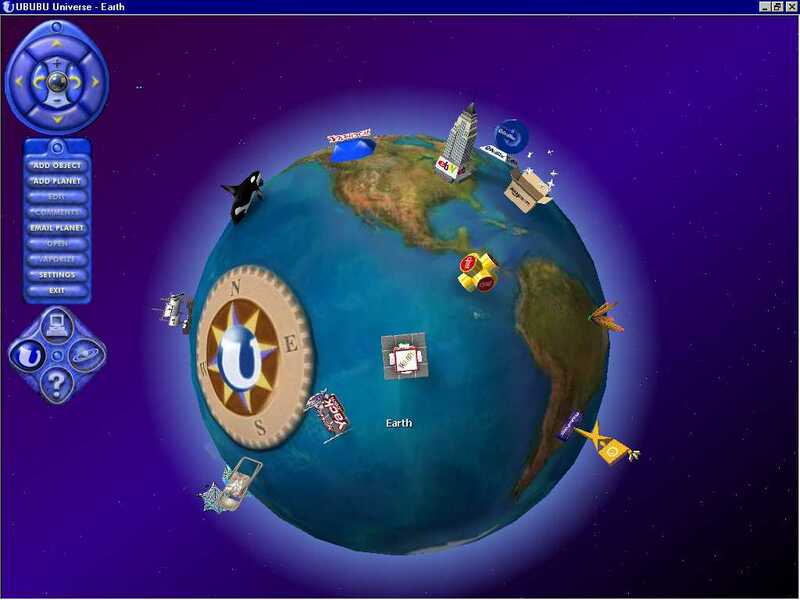 In cospace Web surfers are represented as avatars and can communicate with each other. It was developed by Thomas Kirk and Peter Selfridge at AT&T Labs. An example of Plumb Design's Thinkmap information space being used to map out a visual thesaurus. 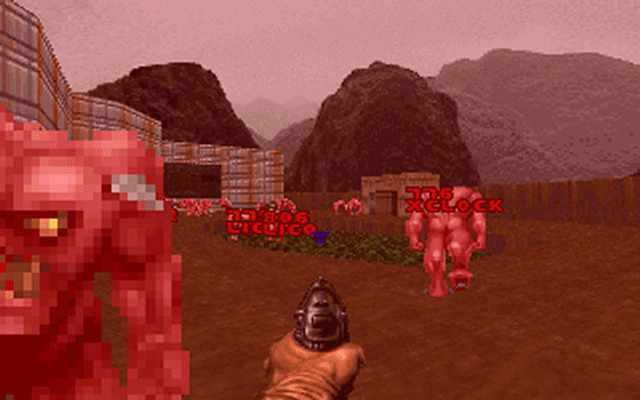 The popular game Doom is used as a 3D information environment for Unix system management in a neat tool called PSDoom developed by Dennis Chao at the University of New Mexico Department of Computer Science. His paper "Doom as an Interface for Process Management" gives more details. 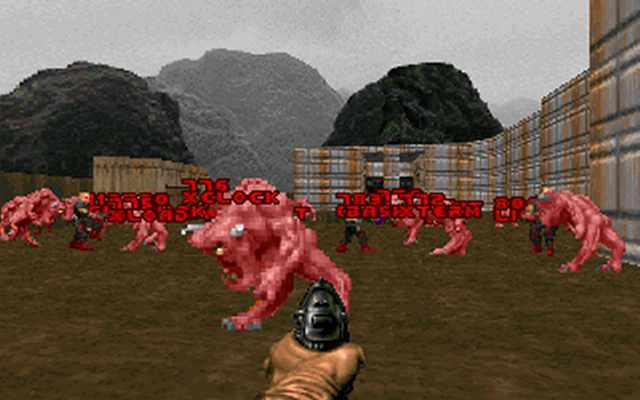 The computer processes are represented by individual monsters which you can kill! The Starlight visual information analysis environment developed by John Risch and researchers at the Pacific Northwest National Laboratory. The system provide an immersive, fully 3D environment to display and analyse complex multimedia information collections and it was originally developed for US intelligence. 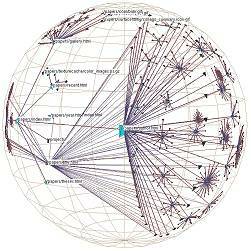 A "semantic constellation" of an information space. The balls represent documents and their spatial arrangement shows relationships between them. It was produced by Chaomei Chen, Department of Information Systems and Computing, Brunel University. Web Forager, a 3D information workspace for interacting with the Web. It was a prototype developed in 1996 by Stuart Card, George Robertson and William York, at Xerox Palo Alto Research Center. More details are given in their CHI paper, "The WebBook and the Web Forager: An Information Workspace for the World-Wide Web". 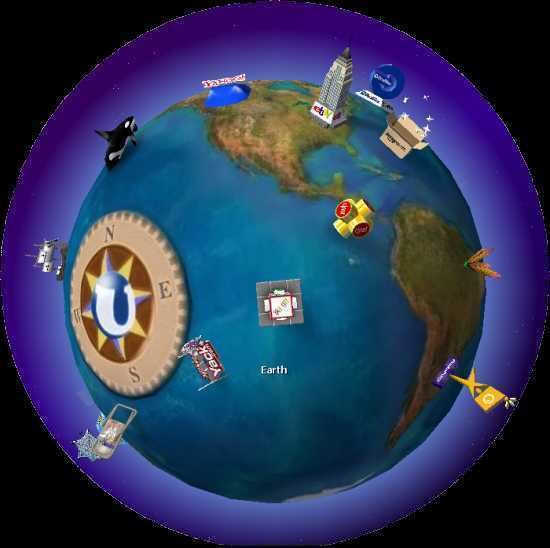 UBUBU is a visual bookmarking tool for the Web using the spatial metaphor of icons on a three-dimensional planet.